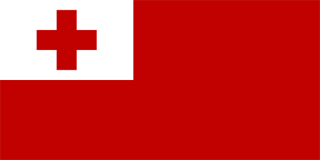 The flag of Tonga was officially adopted on November 4, 1875. One of the oldest flags of the island countries in the South Pacific Ocean, the flag's widely recognized red cross is symbolic of Christianity coming to the islands; white symbolizes purity, and red represents the blood of Christ. 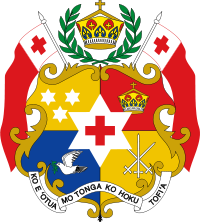 The coat of arms of Tonga was adopted in 1875, and features a large shield divided into four quarters. The Royal Crown of Tonga is displayed in the top-right quadrant, the top-left contains three stars, the bottom-left a dove holding an olive branch, and in the bottom-right are three crossed swords. Each of these symbolize an important element for Tonga: the dove and olive branch are for the wish of God's peace (taken from the story of Noah and the Great Flood), the three stars represent the main island groups of Tonga, the crown is for the ruling monarchy, and the swords represent the three dynasties of the kings (Tuʻi Tonga, Tuʻi Haʻatakalaua and the current Tuʻi Kanokupolu). 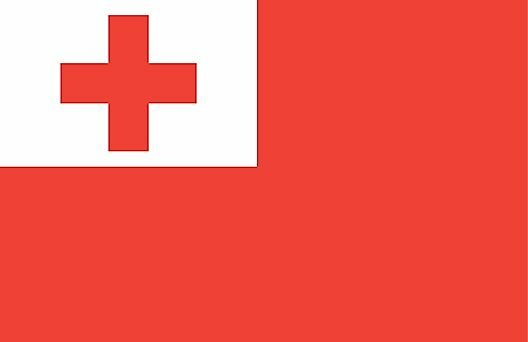 Below the shield, Tonga's motto "Ko e ʻOtua mo Tonga ko hoku Tofiʻa" ("God and Tonga are my inheritance") is displayed on a ribbon, and making up the crest is the Royal Crown of Tonga supported by olive branches.